Since it was April, airfares were low, and the water temperature was going to be much warmer than in the Florida Atlantic or the California Pacific. We booked our stay for Sayulita and stayed at Junto del Rio in a couple of big jungle suites. They were simple, and it was a perfect fit for our group. We surfed and had a great time on the trip. I remember that I was amazed at how beautiful the town, ocean, and people were. I owned my house in Durango, but wasn’t yet in a position to buy a house in Sayulita, even though I loved to look at the real estate options. Upon returning from the trip, I told my wife about what a great place Sayulita was, and we went back the following year. Before we headed down, I looked on Sayulitalife.com at houses that were for sale, and I picked five that I thought might be fun to look at if we were to ever buy and own a house and live in Sayulita permanently. When we arrived, we got a map and visited the local real estate offices to find out where the houses were located. We would walk around and find the houses on the map, like a treasure hunt; it took us all over the different neighborhoods and up and down hills. We had great fun, amazing views, and got some good exercise! At the time, we knew there was no real chance we could buy a house, but we would pretend and would drink margaritas and dream and imagine how amazing it would be if it were a reality. 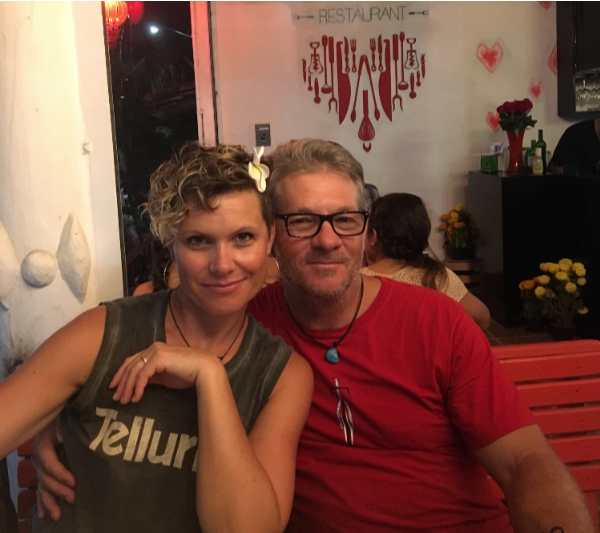 My wife and I came back to Sayulita each spring for the next 10 years. Each time we would stay for two weeks. Sayulita was so easy to get to, and relatively inexpensive. Pretty soon, Sayulita started to feel more like a second home than a vacation, as we learned where all the restaurants, ATMs, secret beaches, and other important stuff was located. We loved the fact that we could leave Durango on an early morning flight and be on the warm, tropical beaches of Sayulita by 2:00 in the afternoon. Traveling can be so stressful, so reducing travel time by a day each way gives you so much more vacation to enjoy. So much about Sayulita reminds me of Manuel Antonio, Costa Rica, but Sayulita was so much closer and easier to access for us. Every time we came back to Sayulita, we would look at houses and continue dreaming about the possibilities. Eventually I convinced my retired father to spend a winter in Sayulita. He had recently been divorced and had moved to Durango from Wasilla, Alaska. He did, and ended up spending not just one, but six winters in Sayulita; he loved it so much. He would walk around town with his wad of pesos in a binder clip, and he never had a single problem; he always felt safe. He later developed an aggressive form of dementia, and in his last winter visit, I took two months off from work to help him get around town. This is one of my favorite memories of Sayulita- getting to walk my dad down the beach each day, or sitting at Villas del Palmar on the sea-wall drinking coffee in the mornings, or wine in the afternoon. While I was helping my dad, the company I worked for called me and told me I was being eliminated as part of a larger scale workforce reduction. I was not to report back to work, but I would stay employed until the end of March and then would receive a severance package. I was scheduled to return with my dad at the end of February to Durango. Just before I left Sayulita, a good friend of mine who helped us with our treasure hunt in looking for a house said they had the perfect place for us to buy. They were also the couple we rented our properties from, and they had also helped keep an eye on my dad. We had asked them many questions in the past about what makes a good house in Sayulita, and the types of houses that could generate some side income to help offset the cost of owning a home in Sayulita. After ten years of looking at houses, we had a very strong idea of what type of house and location we wanted to buy in Sayulita. After looking at the house our friend suggested for us, we thought it was perfect for us! The location, size, colors, and price were exactly what we had been looking for all these years. Thus, we bought the house, and have had it for over three years now. We love it! It is magic. For the last few years, I’ve been spending three months in Sayulita each winter. My wife finally quit her job, and we hope to start spend six months or more in Sayulita each year. Funny enough, there are a lot of people from Durango in Sayulita; the towns have similar energies. I love Sayulita because it is a bohemian paradise with amazing people, food, and vibrancy. I feel so fortunate to be able to spend time in places that I love. My dad passed away six months after that last winter we spent together in Sayulita, so when I went back to Durango, instead of going back to work, I took over his primary care up until he died. Sometimes life gives you a chance for change; in this case it was a blessing. One door closed, and a window to Sayulita opened for us. SayulitaFit Gym- Experience the “Revolution Cycle” Class!